’’This year, we spent our vacation in Provence. 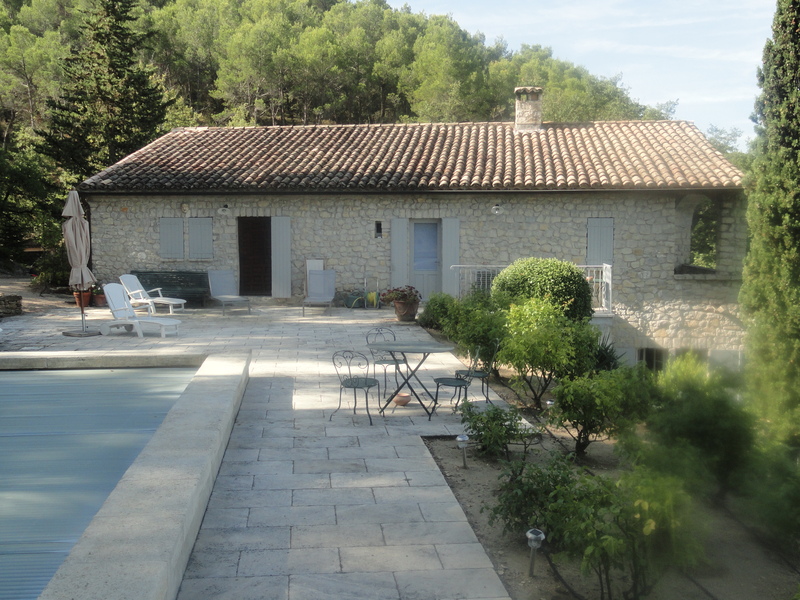 We rented a house in the tiny town of St. Romaine en Viennois, just a half hour or less from the villages of Gigondas, Beaumes-De Venise, and Chateauneuf du Pape. The house overlooks a valley of vines and every morning I enjoyed walking among the vines and watching the farmers at work. 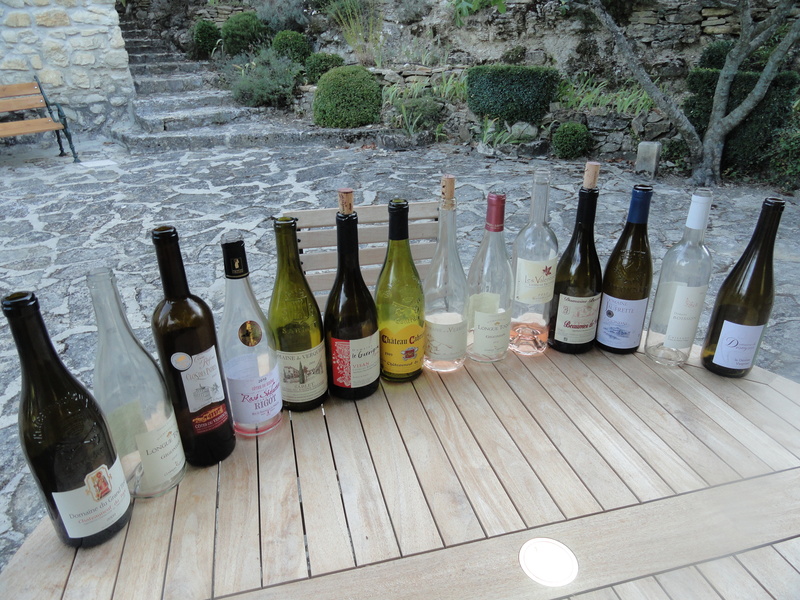 We spent 10 days there and drank a lot of rosé, some whites, and a few reds. 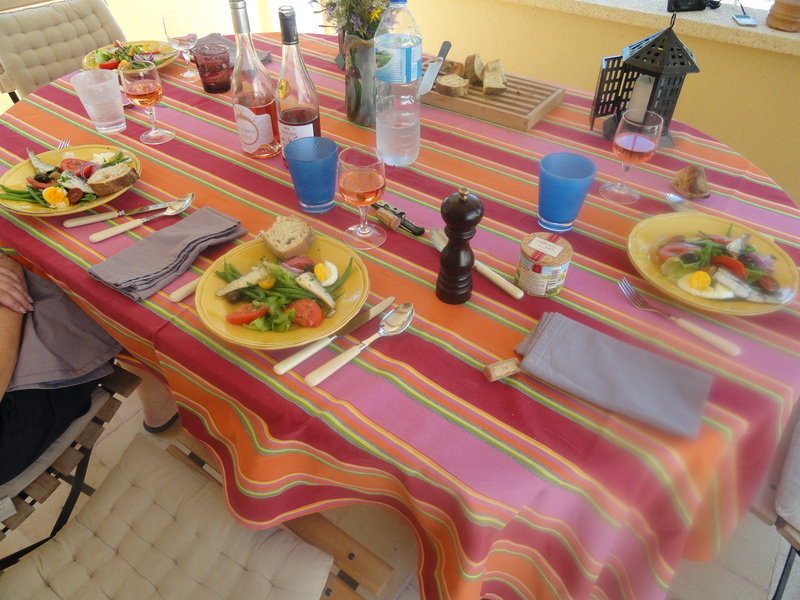 Then we went to a friend’s home in Eze Village for two days. Here we drank mostly red wine. 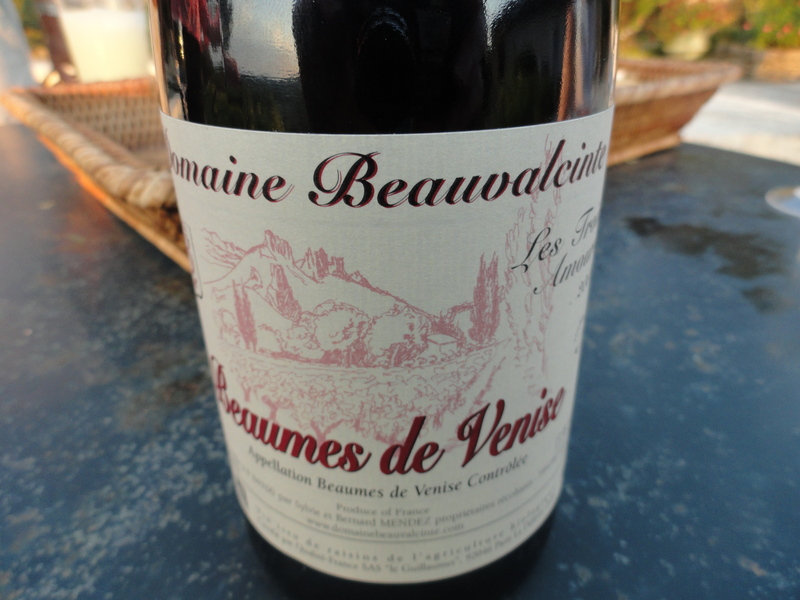 Red Beaumes-De-Venise “Les Trois Amours” 2008 Domaine Beauvalcinte, made from 50% Grenache, 20% Mourvedre, 10% Syrah, 10% Carignan, 5% Counoise and 5% Cinsault. The grapes are destemmed and fermentation takes place in concrete tanks with natural yeast under controlled temperatures. Maceration lasts for 24 days. This was a very nice wine with red fruit flavors and aromas with hints of raspberry. 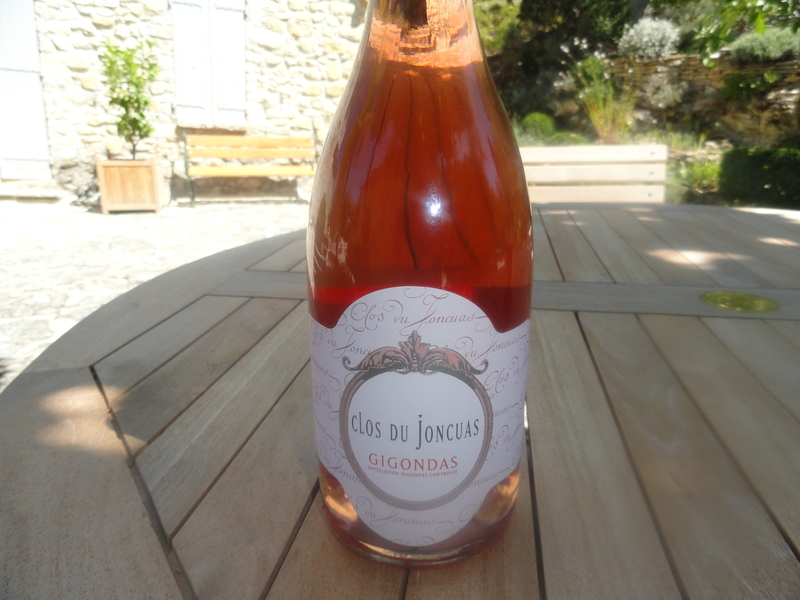 The soil in Gigondas is composed of limestone, clay and small stones which seemed to be everywhere. The vineyards are on the hills and the plateau and can be seen from the village above. 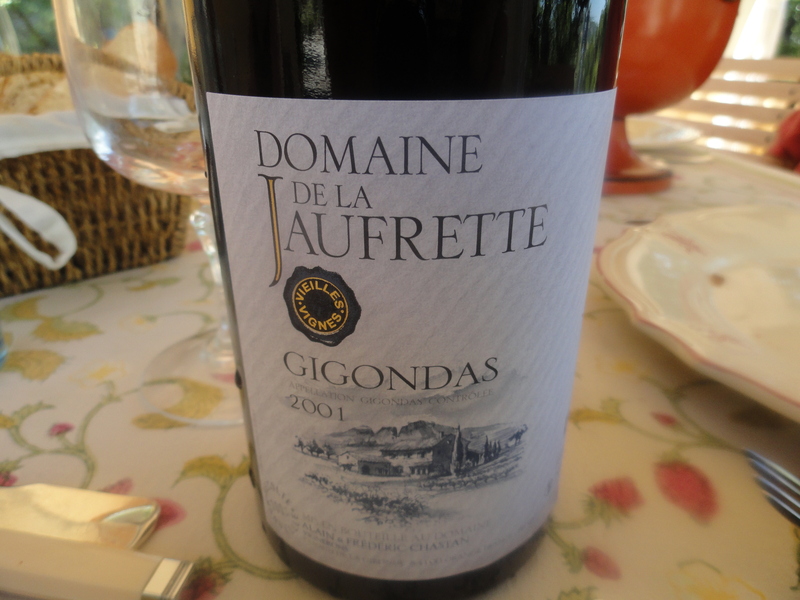 Gigondas 2001 Domaine De La Jaufrette. The wine is made from 90% Grenache and 10% Syrah. It stays 2 to 3 years in vats and 6 to18 months in foudres according to the vintage and 6 to 8 months in bottle before release. The wine was showing very well with dark fruit aromas and flavors and a hint of spice and leather. There was some wine left in the bottle and I had it with lunch the next day. It tasted even better. The territory of Chateauneuf-du-Pape is north of Avignon on the left bank of the Rhone. It covers the five communes between Orange and Avignon. Clay and limestone “galettes,” large round stones, help the vines to withstand the dry Mediterranean climate and the mistral (strong winds). Chateauneuf-du-Pape Blanc 2009 Domaine du Grand Tinel. 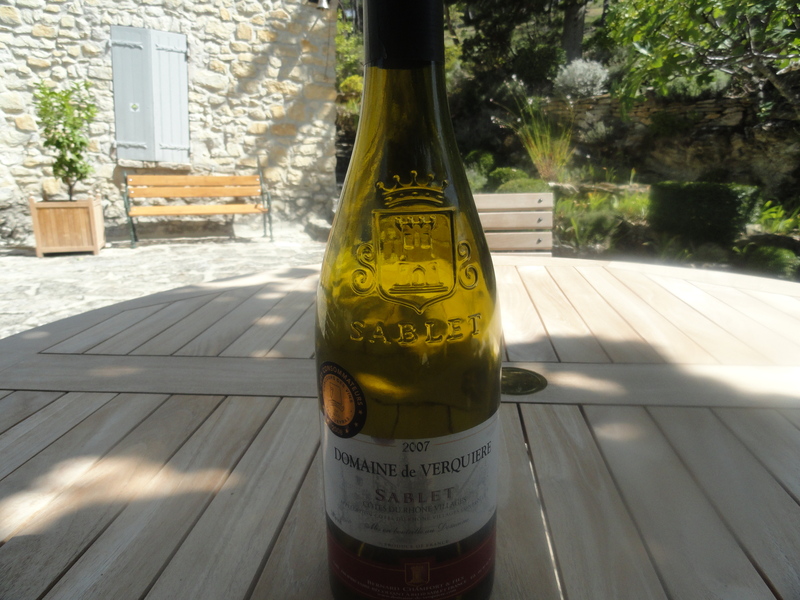 The wine is made from 60% Grenache Blanc, 20% Clairette and 20% Bourboulance. 90% of the wine is aged in stainless steel tanks and the rest in new oak barrels. The wine was dry with a mineral character and hints of grapefruit. It worked very well with tapenade, olives and thumb size sausages that we had as an appetizer. 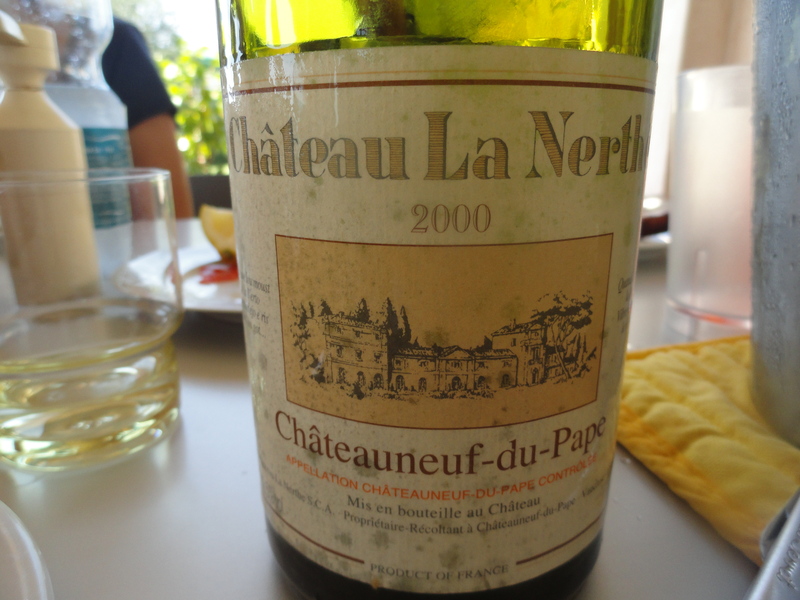 Chateauneuf-du-Pape Blanc 2000 Chateau La Nerthe made from 39% Roussanne, 27% Grenache Blanc,19% Clairette and 15% Bourboulence. I do not think the wines undergo malolatic fermentation and 38% of the wine is aged in wood and 62% in tanks. The wood might be barriques. This was the oldest blanc from here that I have had. The wine was showing its age with ripe fruit and a mineral character but it went very well with the smoked salmon we had with lunch. 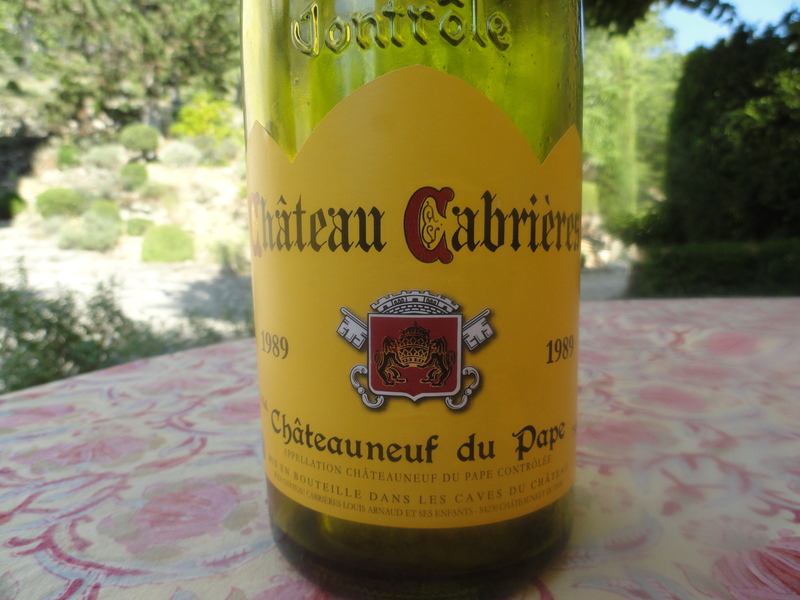 Chateauneuf-du-Pape 1989 Chateau Cabrieres made from 50% Grenache, 20% Syrah 20% Mourvedre and 10 Cinsault. The harvest is by hand and usually takes place in the middle of September. There is a select sorting of the grapes. Fermentation lasts for 4 weeks and includes pumping over, delestage and later malolatic fermentation. The wines are assembled and undergo a light filtration and are aged in Allier oak for 6-12 months. It was drinking like a good older wine with hints of black fruit, prune and spice. It had a nice finish and aftertaste. The fishing village and seashore resort of Cassis is situated in the western part of the Cote d’Azur not far from Marseille. The appelation is restricted to the commune of Cassis which covers only some 80 hectares. Here they produce white, rosé and red wine. 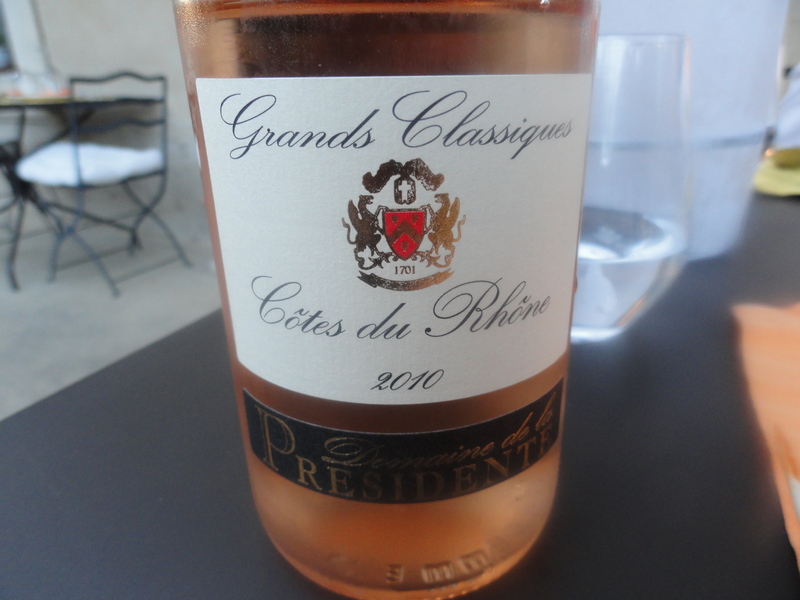 They are known first for their whites, somewhat for their rosé, and least of all for their reds. At the house of a friend in Eze Village I was able to taste all three. 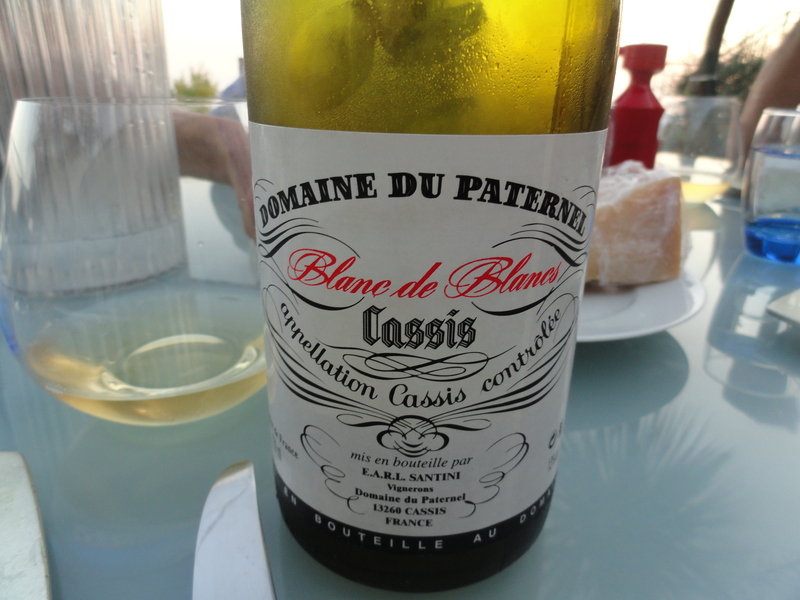 Blanc de Blancs Cassis 2009 Domaine du Paternal made from Ugni Blanc, Clairette, Marsanne and Doucillon. I was very impressed with this wine. 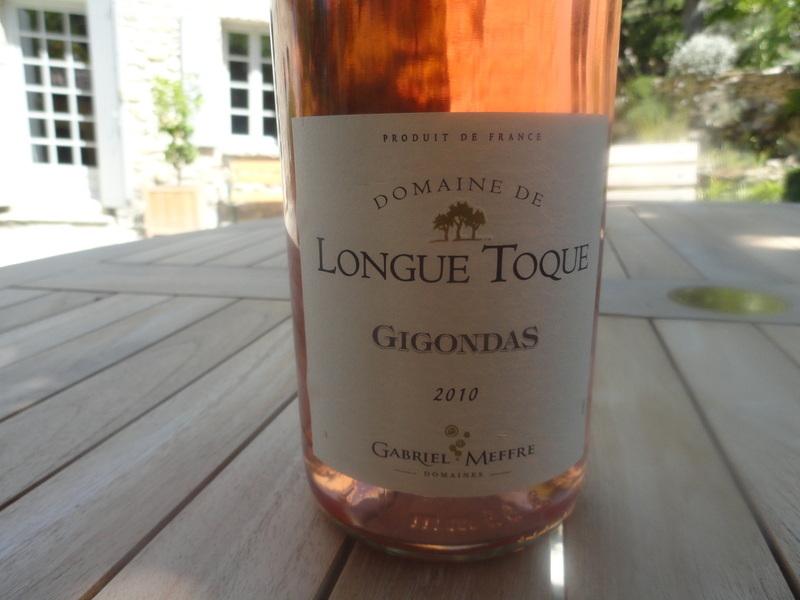 It was balanced, with good acidity, aromas and flavors of grapefruit, herbs, a touch of spice, good mineral character and a very nice finish and aftertaste. It was a delight to drink on the terrace looking at the village of Eze. 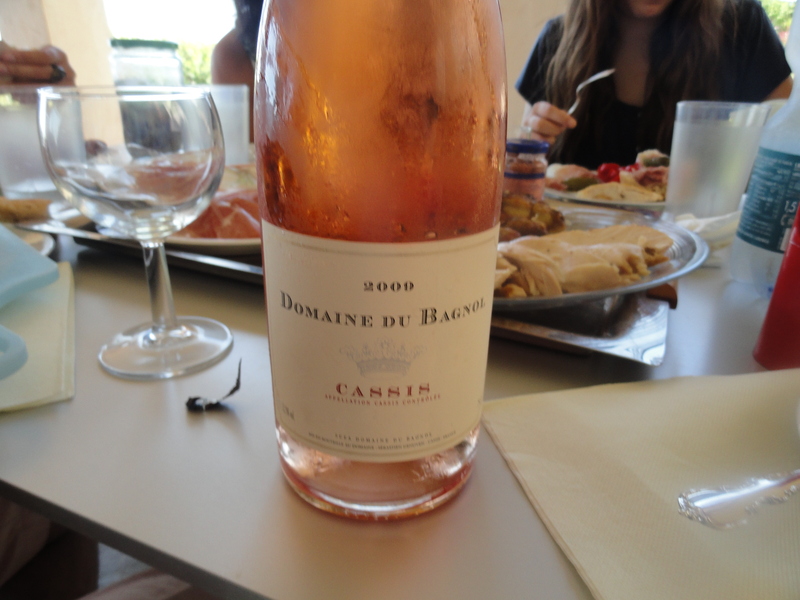 Rosé Cassis 2009 Domaine Du Bagnol made from Grenache, Mourvedre, Cinsault, and Carignan. 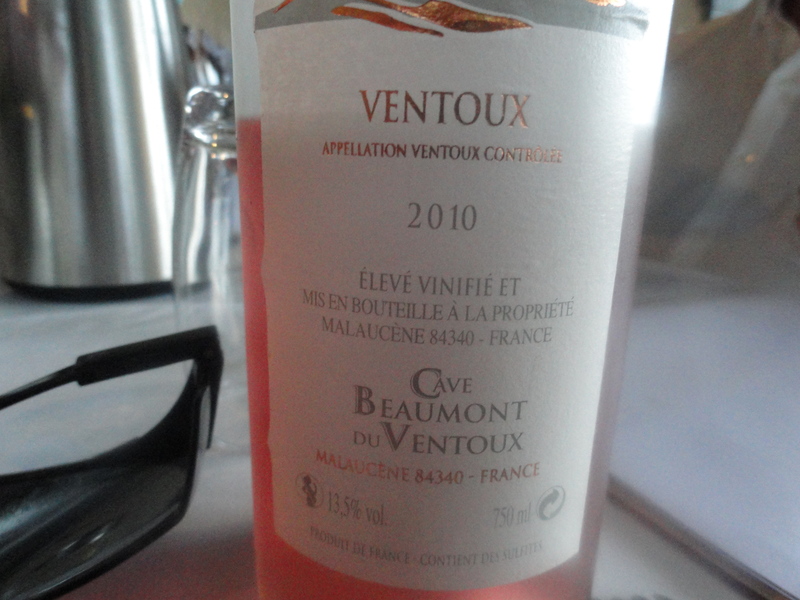 This is a fruity wine with a dry, full body with hints a strawberry and raspberry. 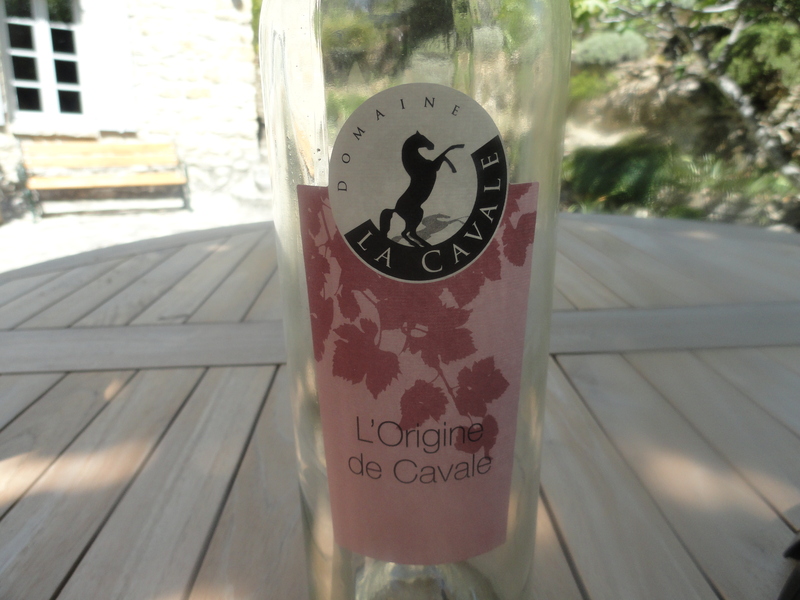 Red Cassis 2008 Domaine du Paternal made from the same grapes as the Rosé. I had never had a red wine from Cassis before. The red was interesting but not as good as the white. Cornas, scorched earth. The production zone has a south/southwest exposure with a semicircle of hill which protect it from the winds and steep terraced hills. The soil contains granite. It has a hot and dry Mediterranean climate. Because of these factors, the grapes are the first to be harvested in the Northern Rhone. The area covers 115 hectares all planted with Syrah. 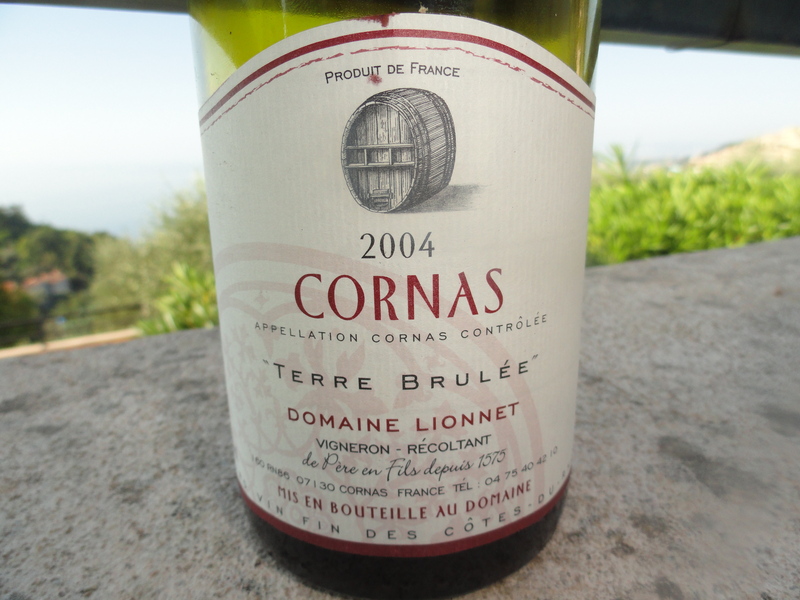 Cornas Terre Brulee 2004 100% Syrah Domaine Lionnet, they only use organic farming methods and all of the work is done by hand. The only have 2.2 hectares and the vines are between 40-100 years old. All the farming is done by the lunar calendar when possible. The land is worked by a tractor or a horse. No additives are used in making the wine. Only natural yeast is used to have a real expression of the terroir. Grape bunches are placed in small open tanks and the maceration lasts for three weeks. The grapes are “walked on” several times a day during this time. The pulp and stems are shoveled by hand into a 19 century vertical press where a slow pressing takes place. The wine is temporarily placed in tanks so that malolatic fermentation can take place. After the wine is racked and separated from the lees it remains in barrels for two winters. There is no filtration and no new oak is used. I was very impressed with this wine. 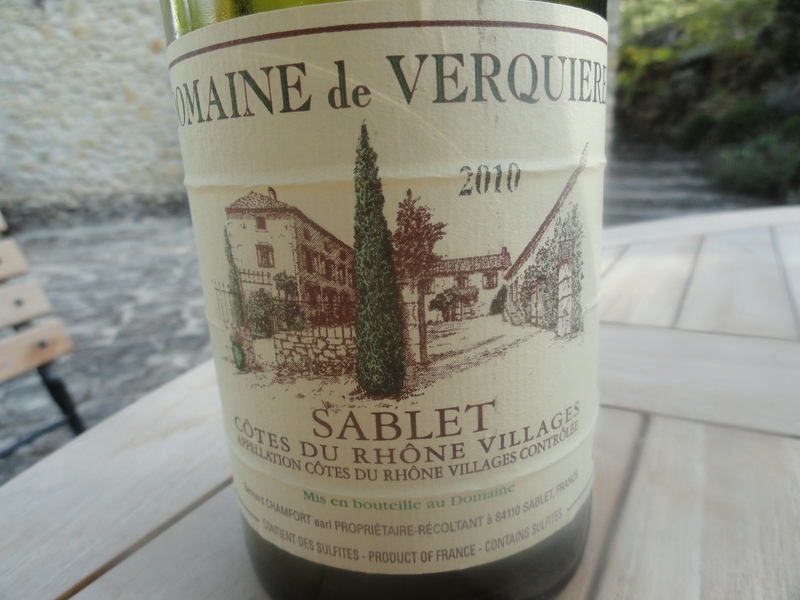 It was a big wine with cooked black fruit aromas and flavors, hints of cassis, spice, licorice and a touch of violets. Just as we exited the Main Street Flushing #7 train station, the skies opened up and the rain began to pour down. Carrying two bottles of wine, two wine glasses, and our umbrellas, we threaded our way through the crowded streets to Fu Run, a restaurant we had never tried before, wondering all the while if it would be worth the trip. Normally, when Michele and I go for Chinese food we prefer to drink tea. But it is always interesting to go to a Chinese restaurant with friends, in this case members of The Wine Media Guild, to see what wines they will bring, and to eat, drink, talk about the wine and the food. Fu Run features the the food of Northeast China. Today it is called Donghei but it was once known as Manchuria. The food began to appear soon after we arrived. In all, there were 17 dishes and they came so fast and were eaten so quickly that I am not sure what they all were. -Muslim lamb chops– lamb ribs marinated and braised with a crispy coating of cumin seeds and hot pepper. The meat was so tender, it fell right off the bone. 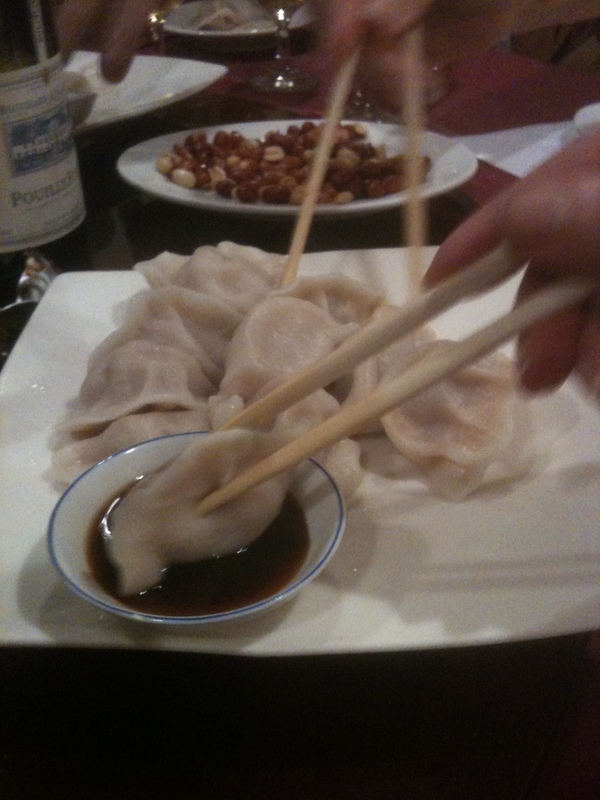 -Three different types of pork dumplings, one with celery, another with leeks and the third with cabbage. I couldn’t stop eating them. 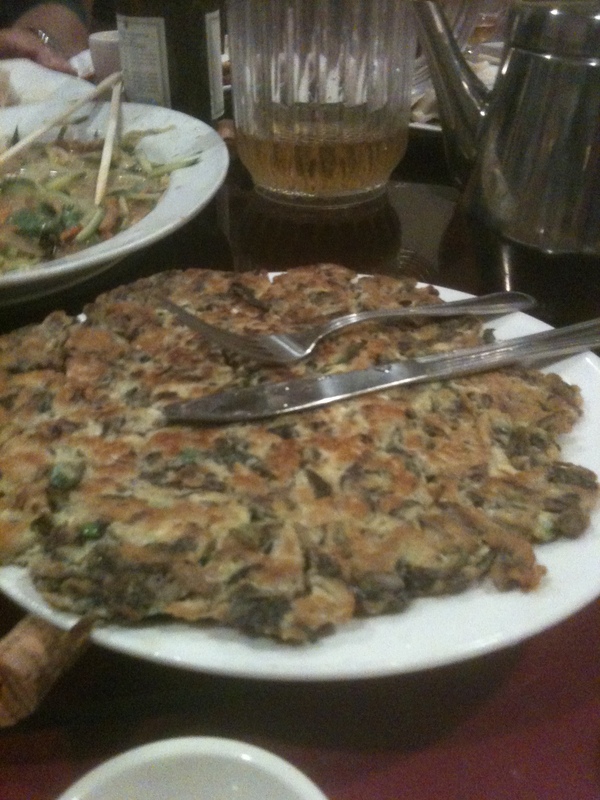 -Egg pancake with leeks and pickled vegetables which was the special of the day. 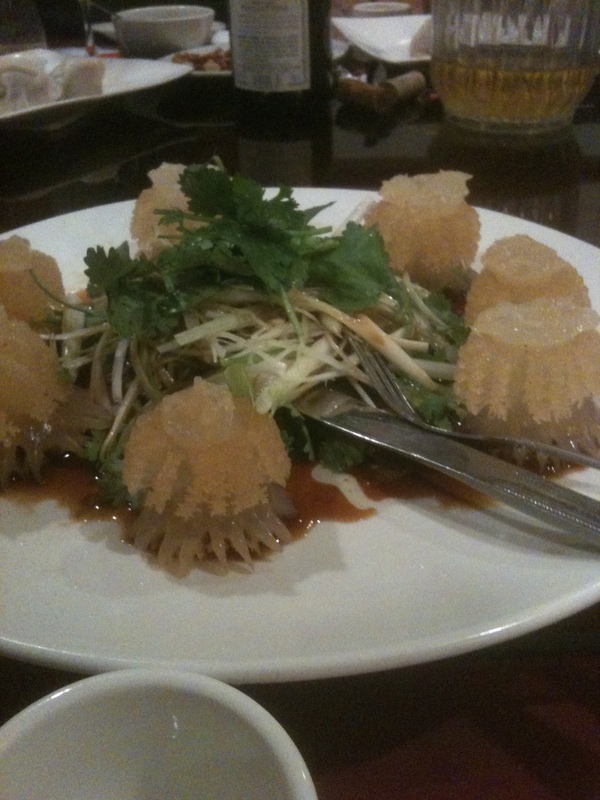 -Jelly fish salad–a light soy and scallion dressing made it very refreshing. A first for me, the jelly fish didn’t seem to have any flavor, just a crunchy texture. 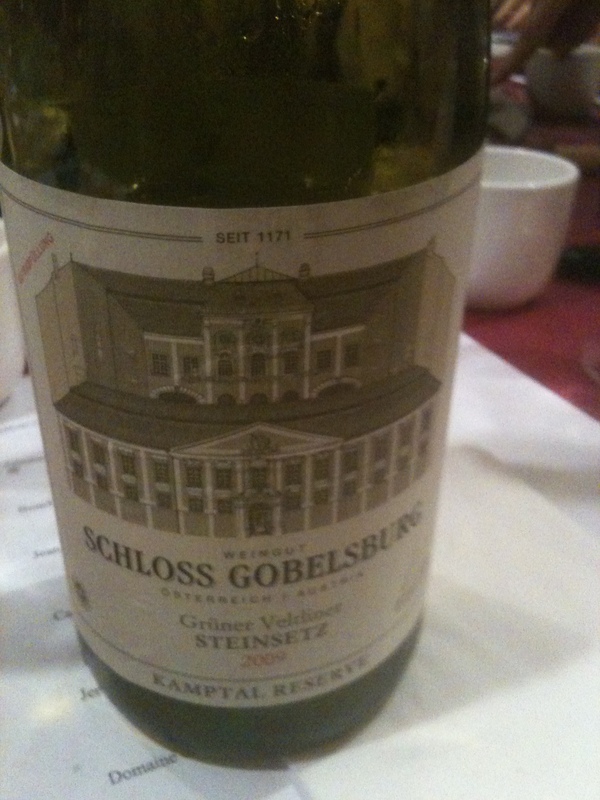 Schloss Gruner Veltliner 2009 Gobelsburg Steinsetz 100% Gruner Veltiner (Austria) The vineyards are located on an elevated plain. The soil is based upon alpine pebbles transported here by the Danube River and covered by black and loamy soil, loess and gravel. The average age of the vines is 25 years. The wine is racked no more than 3 times before it is bottled, unfined and unfiltered. Maturation takes place in Austrian oak casks of 25hl. No new oak is used. The wine is released 30 to 36 months after the harvest. This wine worked with most of the dishes because no new wood was used and it had a mineral character with hints of pepper and spice and good acidity. Campo Martino Ruttaris IGT 2000(Friuli Venezia Giulia) Jermann The wine is mostly Tocai Friulano, with a small percentage of Ribolla Gialla, Malvasia Istriana and Picolit. The wine is fermented and aged in 750 liter barrels of Slavonian oak for 12-16 months, and released two years after the harvest. Capo Martino is the name of a hill in the heart of the Collio zone. The wine was very golden in color and looked like it might be to too old. 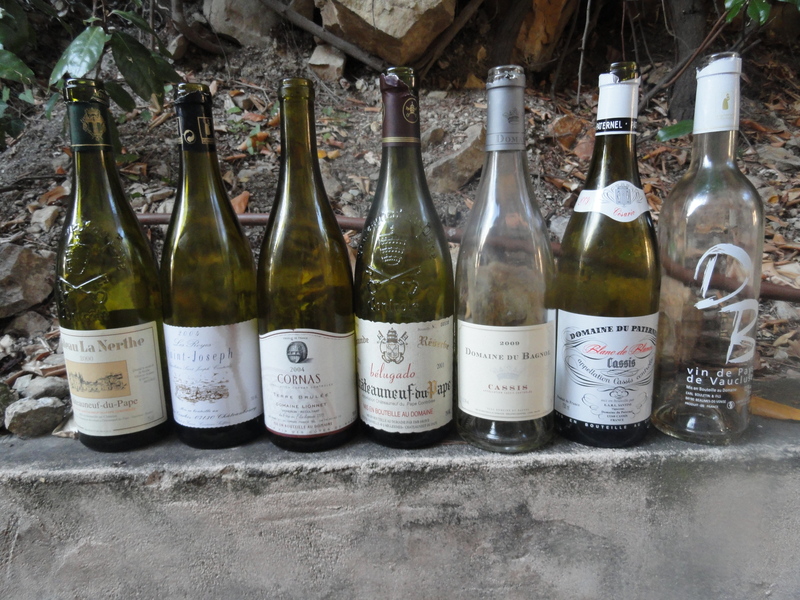 We had already dumped an over-the-hill Meursault and a Pouilly-Fuisse. The Capo Martino turned out to be just fine. A complex wine with ripe fruit aromas, a hint of tropical fruits and a touch of almonds in the finish, this worked less well with the food than the first two whites. It was fuller and richer and seemed to have lost some of its acidity. I liked the wine but not that much with this type of food. 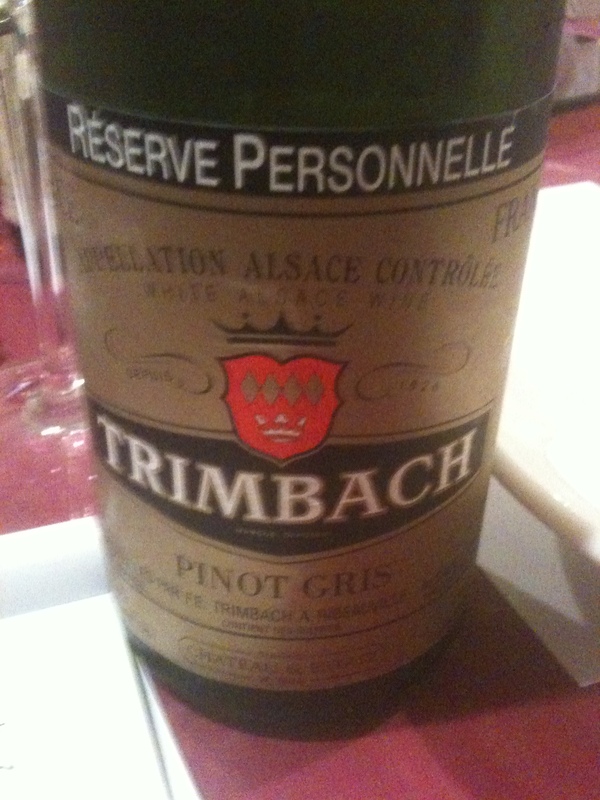 Pinot Gris Personal Reserve 2001 100% Pinot Gris Trimbach (Alsace). Vineyards are Grand Cru Osterberg with a South/Southeast exposure. The average age of the vines is 25 years and there are 5,000 plants per hectare. The grapes are handpicked when they are at their richest and pressed very gently in a pneumatic press. The juice runs into the cellar by gravity and clarifies naturally prior to fermentation. Fermentation takes place in stainless steel at controlled temperatures for 2 to 3 weeks. Fermentation stops naturally and there is a very small amount of residual sugar to go along with the ripe acidity. The wine is not oak aged. Bottling is early to preserve the freshness and bottled aged before leaving the winery. This was the wine of the evening; it has rich and fragrant with ripe fruit aromas of apricot, pear and mango and may be a touch of botrytis. It is full bodied with a creamy texture and well balanced with a great finish and aftertaste. It went very well with all of the food, even the Muslim lamb chops. D’OH 2010 Piemonte Dolcetto DOC 100% Dolcetto Clavesana. Fermentation and a short aging in stainless steel and it is a wine to be drunk young. The name Dolcetto means sweet little one but the wine is dry with a lot of fresh fruit flavors and aromas with a hint of cherry. It has a deep ruby red color. The wine worked with most of the dishes because it was light, fruity and lacking in tannin. Gigonodas 2005 Domaine du Gour de Chaule (Southern Rhone) The average age of the vines is 50 years. There is a 3 week cuvaison. A small amount of pressed juice is added back to the cuvee. Malolatic fermentation takes place in cuve, and after the malolatic fermentation is completed the wine is racked into large oak foudres where it stays for 18 months. The wine is racked no more than three times before it is bottled unfined and unfiltered 30 to 36 months after the harvest. This was a big wine with full fruit flavors and hints of spice and pepper. It went very well with most of the food especially the Muslim lamb chops where it blended in with the flavors of the lamb. Montgarnatx DOC Priorat 2003 Francesc Bas (Spain) The wine is made from 75% Grenache and 25% Carignan. Stony soil composed of slate and quartz. They must have used too much new oak and overextracted the wine because all I could taste were jammy, oaky and vanilla flavors. It did not go with any of the food. 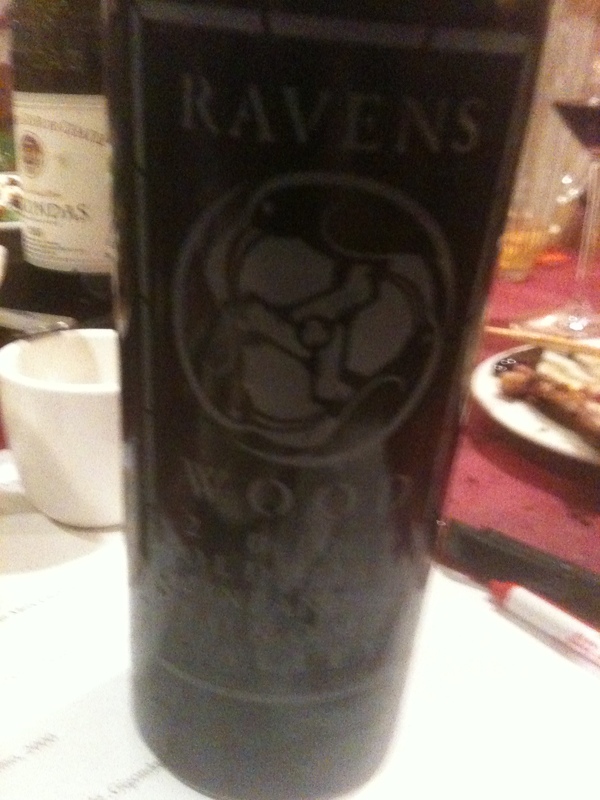 Zinfandel Old Hill Vineyard 2006 Ravenswood (Sonoma) 76% Zinfandel and 24% mixed blacks. This is the oldest vineyard of the Ravenswood vineyards and dates from around 1880. The soil is clay loam and the climate is what Joel Peterson of Ravenswood called “the banana belt of Sonoma Country”. The vineyard is at sea level with a slightly eastern exposure. They use native yeasts, open-top fermentation and punch down by hand. Skin contact is 10 to15 days, French oak aging for 20 months in new and one year old barrels. This is a big wine but seems to be more balanced than the 2007 I had over a year ago. There were flavors and aromas of blackberry, blueberry, coffee and a touch of smoke with a long finish and aftertaste. 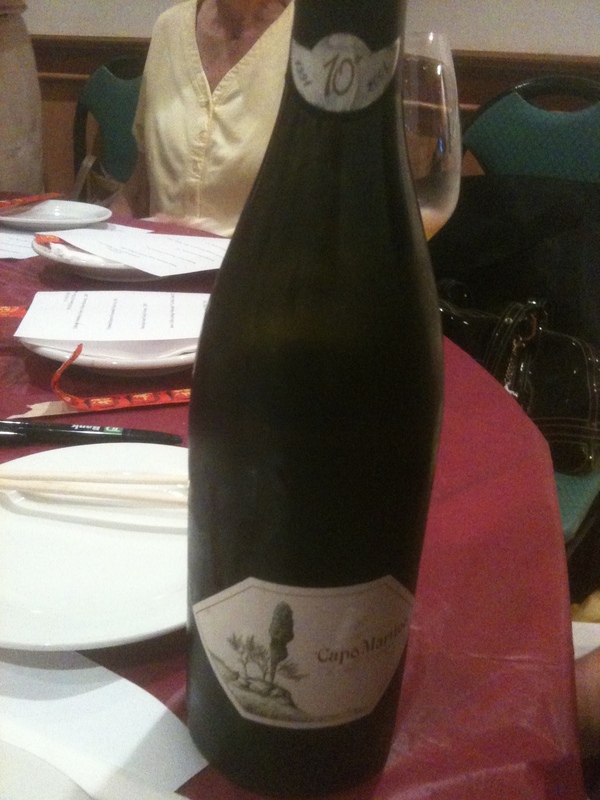 This is a big wine and I felt that it worked with some of the food but not the dumplings and the sea food dishes. As we walked through the narrow streets of Montepulciano, the setting sun cast a strange light and I felt as if I had been transported back to the Renaissance. In fact, sixteen men dressed in Renaissance costumes were at the bottom of the hill leading into town. Two by two, they stood behind eight wooden barrels. As a trumpet and drums began to play, they were off. We had arrived at the start of the Bravio delle Botti, a challenge between the eight Contradas (districts) of Montepulciano for a banner called the Bravium. The barrels each weigh 175 pounds and they are rolled uphill a distance of one mile through the historical center until they reach the Duomo in Piazza Grande. The barrel rollers are called spingitiri. The event started in1337 as a palio (horse race) but in 1973 in became a barrel race. I guess they changed because a number of wine producers have shops in the town selling Vino Nobile di Montepulciano and it seemed more appropriate. No one is sure how this wine became known as Vino Nobile. It might be because at one time it was produced exclusively for the town’s aristocracy. 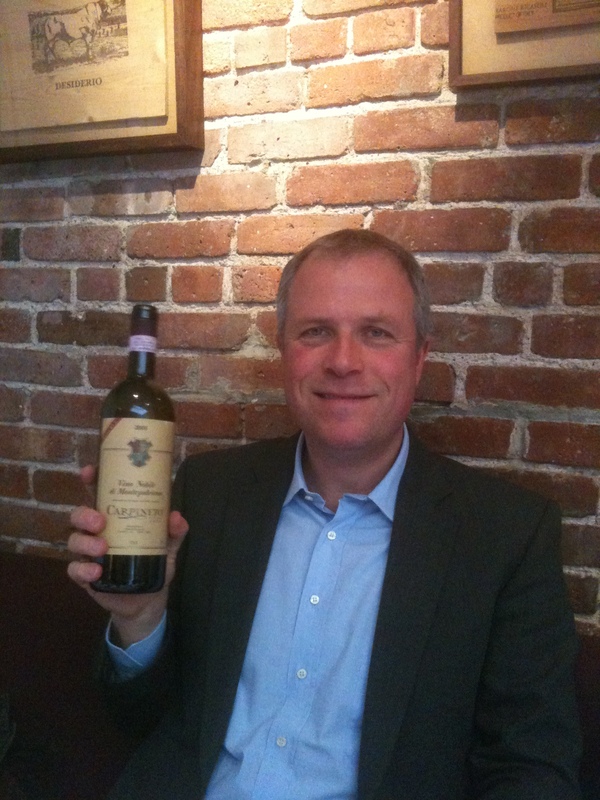 Sheldon Wasserman in his book Italy’s Noble Red Wines states, “Francesco Redi elevated the wine to regal status. In his poem Bacco in Toscana (1685) the god of wine, quite overcome by a cup of Montepulciano declares that Montepulciano d’ogni vino e’re (Montepulciano of all wines is king).” This was a very famous and much-cited poem at the time. But that was in the past. Today, in my opinion, Vino Nobile di Montepulciano does not get the respect that it deserves in this country. It is caught between the more famous Chianti Classic and Brunello, and does much better in Italy and in other foreign markets than in the U.S. As if this was not enough, there is a grape and a wine in Abruzzo which is known as Montepulciano D’Abruzzo. 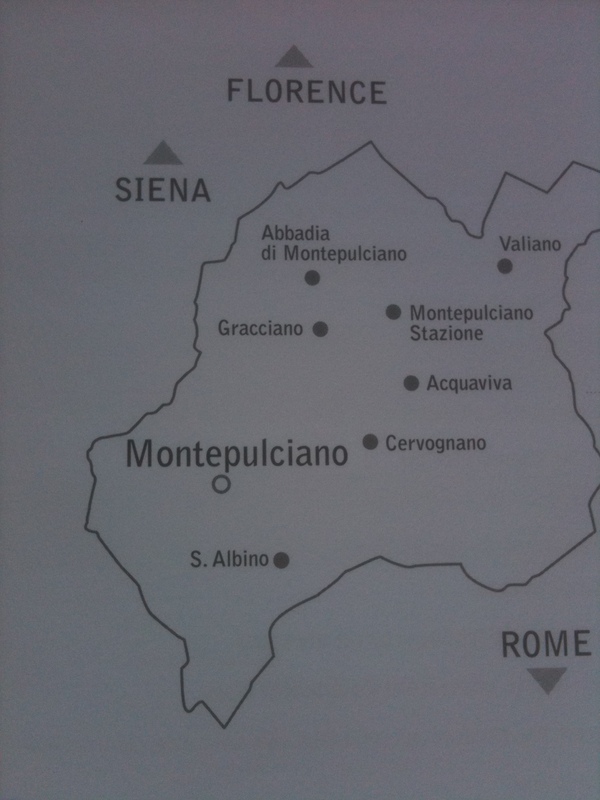 When it is grown in other parts of Southern Italy it is just called Montepulciano. When I worked at a wine store, customers would ask for a bottle of Montepulciano and I would reply, “the town or the grape?” However, I think that little by little it is getting the recognition it deserves. The Vino Nobile Production Zone stretches on one side towards the Val di Chiana and on the other towards the Val d’Orcia in Tuscany. The hills in the zone range in height from 820 to 1968 ft above sea level. The grapes for Vino Nobile are a minimum of 70% to 100% Sangiovese known locally as Prungolo Gentile and a maximum of 30% Canaiolo, Mammolo and other grapes such as Cabernet, Merlot and Syrah recommended or authorized by the Province of Siena. There is a compulsory two year aging beginning after January 1 of the year following the harvest. The wine must be made and aged within the zone. New vineyards planted since 1999 must have 3,330 vines per hectare. Minimum alcohol content is 12.5% and 13% for the Riserva. The Riserva must be aged for three years, and six months in bottle, beginning on January 1 of the year following the harvest before it is released. Both Normale and Riserva must be aged for one year in wood. Prungolo Gentile means “gentle wild plums”. Most of the wines have a hint of violets in the aroma. This may be due to the Mammolo grape, violets in Italian is viola mommola. Vino Nobile di Montepulciano DOCG 2007 Tenuta di Gracciano Della Seta (Toscana) Made from a blend of 90% Prugnolo Gentile,10% Canaiolo and Merlot. 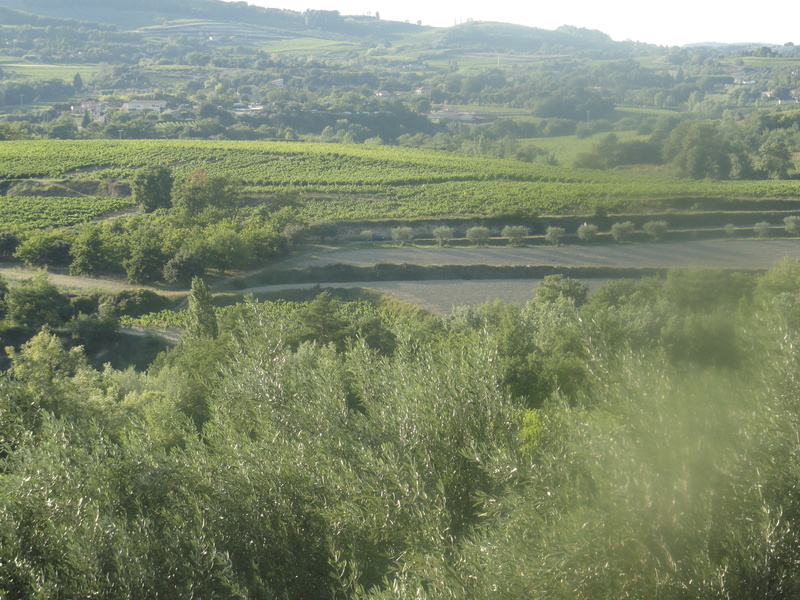 The vineyards are located on the Gracciano hills, the historical cru of Montepulciano. 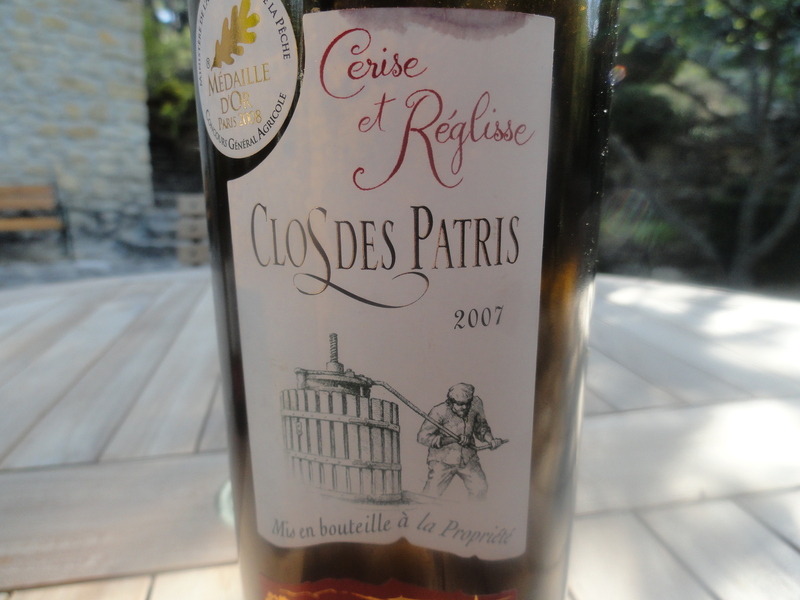 The wine is aged at least 18 months, 30% in French tonneaux of 3.5 to 5 HL and 70% in 25 HL casks of Slovenian oak. The wine has red berry flavors and aromas with hints of raspberries and violets. Goes well with grilled and roasted meats. This Riserva is a blend of 90% Prugnolo Gentile and 10% Merlot. The vineyards are located on the Gracciano hills, the historical cru of Montepulciano. It is aged for 24 months in wood, 12 months in French oak Tonneaux of 3.5 to 5 HL and 12 months in 25HL Slovenian oak casks. The wine is aged an additional 12 months in bottle before release. It has deep red and black berry flavors with hints of blueberries and violets with a touch of vanilla. The finish is long and the berry flavors carry over to the aftertaste. It goes well with steak, game, grilled and roasted meats especially roast pork. Vino Nobile d’ Montepulciano Riserva DOCG 2005 Made from 70% Sangiovese (Pungolo Gentile) and 30% Canaiolo and other authorized grapes. Carpineto Fermentation takes place in stainless steel and maceration of the skins with the must between 10 to 15 days at controlled temperatures. The frequent pumpovers are accomplished using special pumps designed to move solid parts (skins and seeds) gently. The wine is aged in large 5,500 liter Slavonian barrels, with a small part in French barriques. After bottling the wine is aged in temperature controlled cellars for at least 12 months. The wine is aged one year longer than the 3 years required by law for a reserve wine. 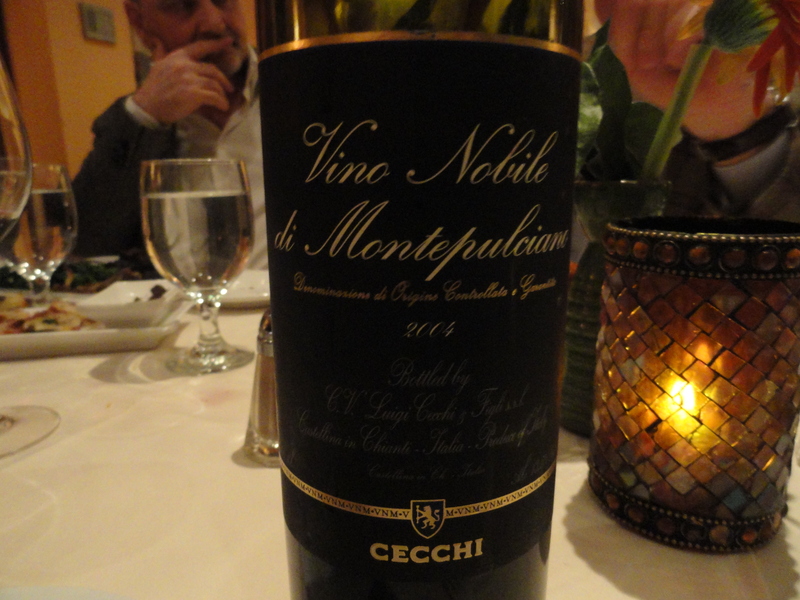 Vino Noble d’Montepulicano 2004 DOCG Cecchi 90% Sangiovese (Prugnolo Gentile) and 10% other authorized grapes. Fermentation takes place in small stainless steel tanks and lasts for 21 days. The wine is aged in small oak barrels for 2 years. It remains in bottle for 3 months and is released 28 months after the harvest. 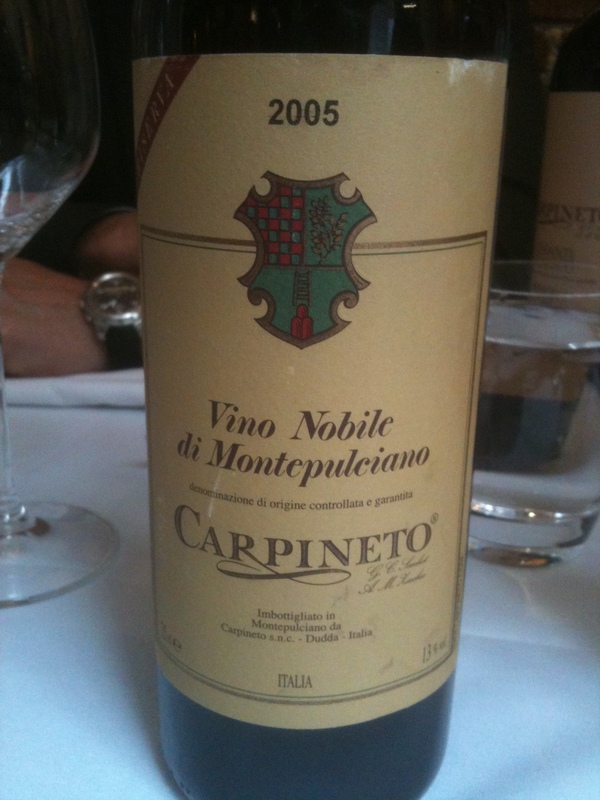 A few months ago I had lunch with Antonio Michael Zaccheo the owner of Carpineto. 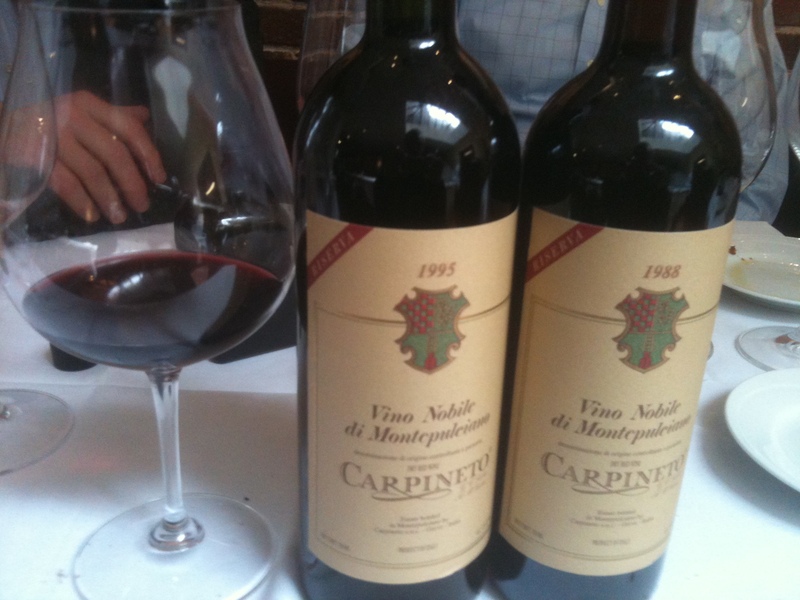 I was very impressed with his Vino Nobile di Montepulciano Riserva 1985 &1988 DOCG. I had a number of questions about these two wines that were showing no signs of age and this is what he said about them. “Our Vino Nobile is made from circa 90% Prugnolo Gentile (Sangiovese) and 10% Canaiolo. In the ‘80’s it was required to include a minimum percentage of white grape varieties, something we never did…we used the Trebbiano and Malvasia for our Vinsanto, and still do. The ‘85 and ‘88 vintages were much the same, climate-wise, to the point that, in retrospect, they can be considered twin vintages. Both are 5-star vintages and have similar flavor profiles with the three years difference possibly accounting for some bottle variation. There are faint hints of red fruits and violets which give way to porcini mushrooms, dried leaves, hints of spiciness and earth, very complex. The texture is silky smooth, with good acidity and a long finish.